Hello, hope your Wednesday is going well. Snow has stopped, just enough to cover the ground, but more expected for the next couple. If you're someplace cold, stay warm, if your someplace warm, you're lucky!! My card today is for the challenge at Crafting Life's Pieces # 32, it's a sketch challenge. 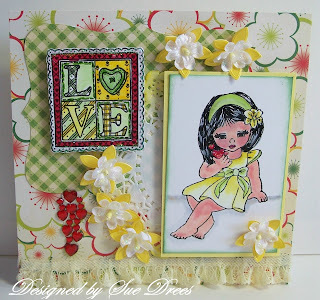 I used a Gurlee Girl stamp by the owner of the CLP Challenge, Chelsea. I have had this stamp for awhile, and never inked her up, go figure!! The papers are by Cosmo Cricket. The gingham is a top note die by Stampin up. Hearts are a cluster by Reflections at Michael's. The flowers are from the bridal department at Michael's. Weird weather year here...no snow...shhhhhh...I am not complaining! Hi Sue, Happy New Year! Wishing 2011 will bring you lots of Happiness and Good Health. Your card is beautiful, I'm so glad you inked her up. A lovely take on the Sketch, so happy you have joined us this month. What a lovely and sweet card! She was just waiting for the right moment to see the ink pad, that's all!! And we are sure glad she did because your creation is adorable!! Lovin' the fun, fresh colours and great textures on your project and great take on Chelsea's sketch too!! What a lovely and cheerful card. You did a super job with your image. Thank you so much for joining us for this months sketch challange at CLP. that little girl is GORGEOUS!!!!! beautiful coloring and design. Hello Sue! Oh gosh, this is so pretty and everything about it looks so bright and happy! I love it! Beautifully coloured and lovely dp's! Thank you so much for joining us at CLP!